Happy Thursday!! I posted this look on my Instagram last week and got so many questions about where everything was from. As a busy mama of two, my go-to outfit looks something like this most days… cute, comfy and relaxed! I discovered lululemon a couple years ago, I have their scuba hoodie and it’s the most amazing thing ever! I love the scuba hoodie! Such a good pick! Thanks! I’m glad you love them! This is a different look on the blog! I love your take on athleisure. Love how it is still feminine! Love it, especially the pink hoodie! What socks (if any) do you have on?? I don’t always wear socks but I do love all of the lulu ones! Especially when I’m working out! I love everything about this look! Looking gorgeous girl! This is such a cute outfit, Rach! 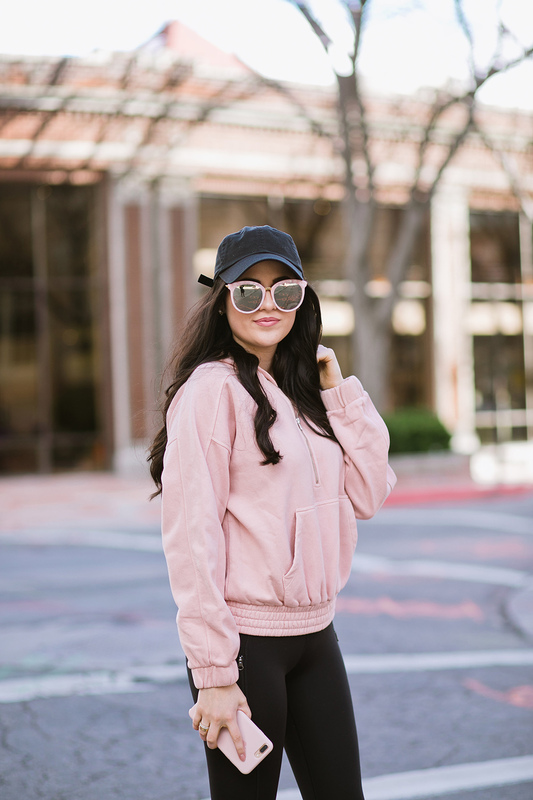 I love the blush and black color combo and the pieces themselves are so cute; I love the hoodie and sneakers especially! Thanks for sharing and I hope you’re having a great week so far! I love seeing you in these more casual looks…so fun! You are adorable. Love this whole look! Love seeing casual looks like this!!! Super cute, sporty outfit! You’re so fit, looking great Rach! Fun sunglasses. Cute mom style! Such a cute outfit! I love how comfortable but cute the sweatshirt looks I need to get something similar! I love that this is a relaxed comfy look but it still looks so put together, especially with all of the pink pieces that coordinate and tie everything together. Love it! Oh my gosh this look is so cute! Seriously loving the blush casual! I totally get what you mean about being comfy while chasing around little ones. Love the pink in this outfit and now need those leggings. Hope you have a great relaxing weekend. Thanks Beth! Glad I’m not the only one! I love dressing up, but sometimes it’s just exhausting haha! I think everyone needs a casual day! Wow, great outfit. For me it´s the same. Often I am too busy, but I don’t want to loose my workout session. So I use my sport dress as ndaily outfit, that gives me more time and keep me motivated. Actually I saw that one of the trends of S/S 2017 is to include sportswear into the daily outfits. Great idea…!!!! Cheers, Katy! Thanks Katy! Yes, the best trend! Those sunnies are so fun!! it seems like you are rehearing sooo much lately. It’s good that certain pieces are versatile but as a fashion blog, it may make more sense to included all of those outfits into 1 post. i.e. “how to rock pink suede booties” with all of your looks versus posting different outfits with the same pieces in different posts. Sporty yet girly, love it!